This author participates in our Book Donation Program. Click here to learn more. Tai Manivong grew up in Tres Piedras, NM. She would spend her days climbing rocks and exploring the national forest near her home. Her love of animals, nature, and fantasy have made Crimson come to life. Tai has a bachelor’s degree in psychology and a Master of Arts in teaching. She currently teaches third grade in Colorado and spends her free time relaxing with her wonderful daughters, reading fantasy novels and writing children’s books. This is her debut novel. The Norterridane, a race of small canines, have raised dragons for as long as anyone can remember. Crimson’s father expects her to be a dragon keeper, just like he is. Her trainer thinks she’s too young and, although Crimson likes the idea of being a dragon keeper, she secretly doubts she’s suited to the job. One night she discovers a clutch of Obsidian dragon eggs and bonds with the hatchlings by accident. Wholly unprepared for the task of raising one dragon, never mind two, Crimson and her new wards are sent to the closest dragon keeper so that she may learn how to train the two hatchlings and keep them safe. It’s a dangerous time to be a dragon keeper on Genorrdia. Vicious serpents, enemies of the dragons, have been spotted and the bones of young dragons found. Crimson will have to master the dragon’s power to protect her two dragons from this formidable threat. I got a thrill when I read the blurb for Crimson and simply had to read this story. 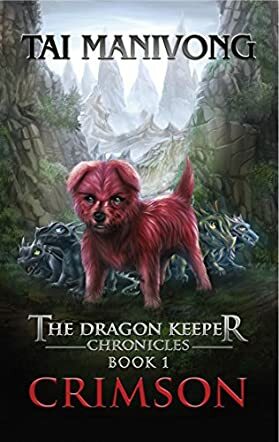 Tai Manivong has created a rich and unique world in The Dragon Keeper Chronicles. The Norterridane are a distinctive race and their bond with the dragons felt natural. Crimson struggles with her responsibilities of raising and protecting the dragons. She’s essentially their adoptive parent and muddles through the transition period from when she first finds the eggs to when she becomes more capable in a manner that’s wholly relatable. The serpents are ominous creatures and I found it interesting that Tai Manivong allowed for some ambiguity on the matter of which side is the ‘right’ side. The exclusion of an adult dragon’s knowledge of the reasons for the war with the serpents leaves all explanations coming from the serpent’s view of the matter. Wonderfully written. An intriguing magical story that kept me glued to the book for days.